In August 2012, as he was heading into reelection against GOP nominee Mitt Romney, President Barack Obama issued a “red line” warning to Syria over chemical weapons use, vowing to intervene in the conflict militarily if the regime of President Bashar al-Assad gassed any of his own people. That reported use was “a game changer,” Obama told Israeli Prime Minister Benjamin Netanyahu in March. 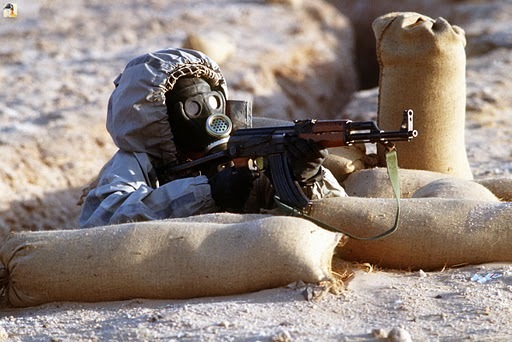 More reports of chemical weapons use by Syrian forces continued throughout the year. In July 2014, as the Syrian civil war was reaching its peak, then-Secretary of State John Kerry assured Americans and the world that there would be no more uses of poisonous gases by the Syrian army, because the Obama administration and the Russian government had struck a deal with the Assad regime to remove all chemical weapons from the country. “We struck a deal where we got 100 percent of the chemical weapons out,” then-Secretary of State John Kerry said on NBC‘s “Meet the Press” in July 2014, in reference to an alleged arrangement made the previous September, the Washington Free Beacon reported. The Russians reportedly agreed to help confiscate and destroy the entire Syrian chemical weapons arsenal. In January of this year, outgoing Obama National Security Advisor Susan Rice touted that ‘deal,’ telling National Public Radio in an interview that the administration had “success” in ensuring that, with Russian assistance, it could then drop the threat of military intervention in the war-torn country. Fast forward to this past week, when – once again – Syrian government forces were suspected of using chemical weapons on rebel forces, in the process killing 70-100 noncombatants, dozens of whom were children. And now Rice, Kerry and other Obama administration officials including the former president are under fire for making those demonstrably false claims – or, at a minimum, for once again botching a foreign policy initiative in a manner that is on par with the botched Benghazi incident. “There can be no dispute that Syria used banned chemical weapons, violated its obligations under the Chemical Weapons Convention and ignored the urging of the U.N. Security Council,” said President Donald J. Trump, who on Friday ordered a massive cruise missile strike against the government-held airbase in the which the latest chemical attack was believed to have been launched. The destruction was near-total, according to reports. Frankly, we should have known the Obama administration wasn’t being honest. An August 2016 U.N. report found that Assad had used chlorine gas on two separate occasions against civilians in 2013, but despite the findings in that report, the Obama White House continued to claim it was successful in disarming the Assad regime. As for Russia, Secretary of State Rex Tillerson slammed Moscow for failing to do its part in the 2013 agreement. “Either Russia has been complicit or Russia has been simply incompetent,” he said. So much for the Trump-Russia love-in collusion narrative, eh Democrats?